Thanks, Bianca. It's still plenty sweet! Just not cloyingly, toothachingly. One of my favourite puds, after a large bowl of soup at this time of year. Mmm, Joanne, wish I was having that meal right now! none of that proper cheffy custard! Might be just a bit much sugar for me to fix for my hubby. But it sure sounds yummy. Glad you like it, frayed! Of course, I make "that proper cheffy custard," but Bird's is certainly beloved! Thanks, Linda! 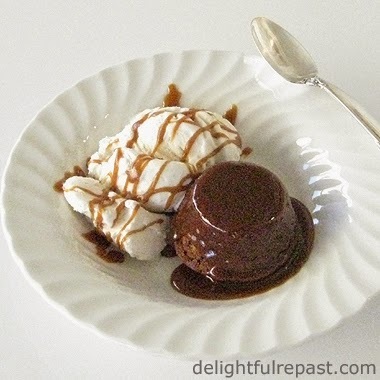 Yes, those of us who like to limit our sugar can certainly make do quite nicely with a lot less of the toffee sauce. Thanks, Amy! Yes, I know Brits love their Bird's custard, but unless I'm making it for someone who is allergic to eggs I'll stick with my eggy custard sauce! I'm with you on that, Judy - homemade peach pie is my all-time favorite, but this is really good! This is The Vikings favourite pudding. I love your recipe. It's quite different to mine which is good to see. Yours also looks quite incredible. The sticky toffee pudding always reminds me of Christmas. It looks decadent and wonderful for the cold season. Thank you, Dom! 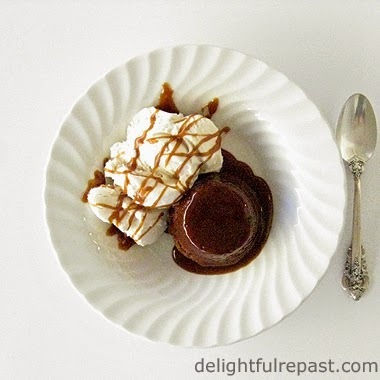 Sometimes after I post a recipe, I'll look at other bloggers' versions. I was amazed to see the differences in STP recipes. Angie, thanks. Yes, this tastes even better during winter! Judy, thank you so much! But I'd want to bring it to *your* house so I could pet your cat! I've never even heard of Sticky Toffee Pudding and this is the 2nd recipe I've seen for it today. BJ, and now you'll probably start seeing several recipes for it every day -- funny how that happens! Sully, I humbly accept your 5-cleavers award! Not sure if it's the molasses, the dates or what, but there is a little hint of the "sour" that you mention. You're killing me here Jean! Am I going to have to make yet another one of your delicious desserts? I think yes. Seriously though, it sounds amazing. Oh, Richard, thank you! Do let me know how it turns out for you. I think you're going to love it. Oh, Greg, DO make it! And let me know how you and your friend liked it! Hi Jean! Yummy! What a perfect portion of DELICIOUS! Thanks, Pom Pom! It's especially good during fall and winter. O M Goodness! I couldn't pin this fast enough. I've always wanted to try making a sticky toffee pudding, and by all accounts, Jean, this looks to be a great jumping off point. Brooks, thank you so much! I'm all about the homey English desserts. Hope you'll make STP soon! That looks yummy. I have a good one for you to try. Ever hear of Spaghettieiz? Not sure about that spelling. It is ice-cream spaghetti and is a big hit in Germany. They put ice cream through a potato ricer and make sauce out of fruit! Google it! Looks like fun. Thanks, Lana! I googled it - spaghettieis - looks like fun! Blissmum, oh yes, it is wonderful with custard! I posted my custard sauce recipe some time ago. I put it on everything! (Maybe because my mother's family is from the north?) You might like my slow cooker steamed pudding recently posted.